Normally, I think of pizza as a casual dinner - one that you'd enjoy with a beer. But sometimes I like to elevate it to a "wine-worthy" dinner. This pizza just felt too fancy for beer. You start with a standard pizza dough, then top it with mushroom pesto, sauteed wild mushrooms, fontina, and Parmesan. My grocery store carries a pack of assorted wild mushrooms, so I just bought those. I believe it's a mix of cremini, shiitake, oyster, and portobello. I sauteed them in a little butter, then amped up the flavor with some garlic, fresh thyme, and white wine. And while the pizza as a whole was really delicious, the mushroom pesto is what made it special. 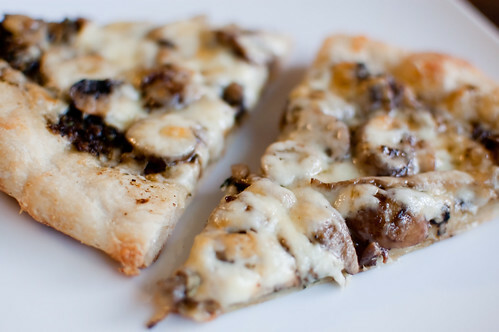 It uses a combination of dried porcinis and roasted mushrooms to maximize the mushroom flavor. I gave it even more by replacing half of the olive oil with truffle oil. I loved the pesto so much that I was tempted to just eat it with a spoon for my dinner, but I managed to save it for the pizza. I will definitely make it again to serve with pasta though. Or stuffed into chicken or pork tenderloin. Or for another one of these pizzas. Preheat the oven to 500 degrees for 30 minutes, along with the pizza stone. Meanwhile, prepare the mushrooms. In a skillet set over medium heat, melt the butter. Add the mushrooms and saute until browned and softened, 5-8 minutes. Add the garlic and thyme and cook until fragrant. Season with salt and pepper, then pour in the wine. Cook until the liquid has evaporated and remove from heat. On a large square of parchment paper dusted with cornmeal, stretch the pizza dough into a 12-inch circle. Brush the outer edges with olive oil, and spread the pesto over the dough, leaving a small border (about 1/2 inch). Scatter the mushrooms evenly over the pesto, and top with the fontina and Parmesan cheeses. Carefully transfer the pizza and parchment to the preheated stone, and cook about 10 minutes, or until the cheese is melted and bubbly and the crust is lightly browned. Allow to cool 10 minutes before slicing and serving. Adjust oven rack to lowest position and heat oven to 450 degrees; line rimmed baking sheet with heavy-duty foil. On the baking sheet, toss sliced mushrooms with 1 tablespoon oil and salt and pepper. Roast, stirring occasionally, until browned and crisp, about 20-25 minutes. For the last 10 minutes, add the garlic, in their skins, to the pan to roast as well. Peel the garlic when it's cool enough to handle. Meanwhile, soak the dried mushrooms in 1/4 cup boiling water for about 5 minutes. Strain through a paper towel-lined colander and reserve the liquid. In bowl of food processor fitted with steel blade, process roasted mushrooms, garlic, porcini and liquid, shallot, thyme, parsley and remaining 3 tablespoons oil until smooth, stopping as necessary to scrape down sides of bowl. Transfer mixture to small bowl and stir in cheese; season to taste with salt and pepper. Tracy, I love Fritti! Sadly we don't get down there as often as I'd like though. Last time we had the calamari pizza and it was sooo good! My jaw literally dropped at the words "mushroom pesto". It sounds incredible! I've never heard of it before, but I'm going to start putting it on everything! Thanks for sharing this recipe. Mushroom Pesto?? Count me in! This sounds delicious Josie! Friday night is pizza night in our house ... this recipe may have just trumped all other ideas!! Yum. 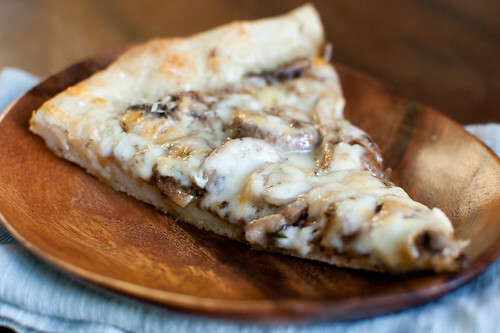 Pizza is one of my favorite foods and I love mushrooms. I think I'm going to have to try this. It must be delicious. Wild mushrooms are so flavorful...really love them!!! YUM, love this, looks delicious! Oh sweet jeebs, I already ate dinner but this is totally making me hungry again. Hi June, there can sometimes be "debris" in the wild mushrooms - I assume it's dirt, etc. So straining through a paper towel gives you just the liquid and the mushrooms. Hope that helps! I made this last week because I love mushrooms and the idea of mushroom pesto sounds insanely good. I used hedgehog mushrooms which are my most favorite of all. I thought it was a bit bland. I like the idea of substituting some truffle oil and will give that a go. Any other ideas to spice it up a bit more? I'm not willing to give up on this one yet. I think that the mushrooms need to be seasoned really well. They can seem kind of bland on their own. I also think using a really good Parmesan cheese is a good idea. Other than that, I guess it's just a matter of personal preference. Maybe add some extra garlic and/or fresh herbs? Hope that helps! thanks for sharing it was so delicious!!! http://hermeshandbags.finniwolf.com The environmental protection agency carries said that but not just is right now unresolved, But it won't consider wearing credit cards handbags a serious problem [root: Spivey]. 2) ready your plant transport for reinvigorating one particular originates and also hermes weight loss belt flowers alongside florist's cable or vivid adhesive.